The Cannabis Act, also known as Bill C-45 passed by the federal government of Canada is coming into effect on October 17, 2018, which legalize recreational use of cannabis nationwide in Canada. Canada is the second country in the world, and the first G7 nation, legalizing recreational marijuana. (Uruguay was the first one). 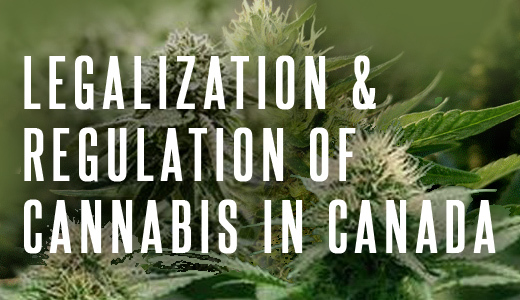 Cannabis/marijuana regulation laws of Canada varies by province or territory. As per the new law, marijuana for adult use can only be sold in packages of a single colour without graphics other than the logo and a health warning. Cannabis companies in Canada will not be allowed to promote themselves through advertisements. In December 2017, Ontario passed legislation that establishes rules for the lawful use, sale and distribution of recreational cannabis also called marijuana. In Ontario, the minimum age to buy, possess, consume and cultivate recreational marijuana/weed is 19. This is the same as the minimum age for tobacco and alcohol sales. Even though recreational cannabis/ weed will be legal for adults, 19 and older, it will still be prohibited in schools, public places and work places. New laws introduce stiff penalties for selling marijuana to minors, illegal distribution or sale and driving while impaired. Giving or selling marijuana to youths under 18 and producing cannabis in excess of the personal cultivation rules carry a maximum penalty of 14 years in jail. The use of recreational cannabis/marijuana/weed in workplaces or motorized vehicles is prohibited. As of October 17, 2018, the Ontario Cannabis Store (OCS) website will be the only legal option for purchasing recreational marijuana/cannabis. The Ontario Cannabis Store (OCS) is a subsidiary of the LCBO. Those over 19 can legally purchase a range of cannabis products and accessories. Online orders will be delivered safely and securely. Consumers will be required to verify their age to accept delivery. For cannabis delivery, the same responsible practices provided by the LCBO for online alcohol sales will be employed, including ID checks and signature upon delivery, and no unattended packages left at the door. Note: As per the federal law, OCS products will initially include dried and fresh cannabis, cannabis oil, as well as a selection of cannabis accessories. Currently, the sale and consumption of Cannabis edible products and concentrates are not made legal. From October 17, 2018, online sales will be available through www.ocs.ca. The online retail store will provide cannabis education, product information, and responsible use guidelines to help adults in Ontario to make informed decisions. Products will be stored, packaged and distributed in a safe and controlled manner. In order to ensure the quality an safety of the cannabis products to the Ontario Cannabis Store have undergone rigorous reviews and approvals with Health Canada. Can purchase maximum 30 grams of dried recreational cannabis at one time for personal use. Can posses maximum 30 grams of dried cannabis in public at any time. The law allows to grow up to four plants per residence (not per person). There is facility to purchase legal seeds from the Ontario Cannabis Store online from October 17, 2018. The production and sale of marijuana/ cannabis for medical purposes is regulated exclusively by the federal government. Residential vehicles and boats that have permanent sleeping accommodations and cooking facilities, and are parked or anchored. Its illegal to consume cannabis (smoking, vaping, eating) in a vehicle or boat that is being driven or is at risk of being put into motion. Using cannabis and driving is illegal and dangerous. New regulations authorize police to test drivers’ saliva to determine if they are drug-impaired.